I didn’t plan on participating in Cyber Monday. But ever since I wrote about the hidden way to create online Facebook Offers for e-commerce sites, I’ve been itching to give it a run. I didn’t start my campaign until 10:22am on December 2, which was Cyber Monday. That campaign ran until midnight on the morning of December 3, so it didn’t even last a full 14 hours. Lack of preparation. Very short window. A confusing landing page. And yet, this online Facebook Offer resulted in nearly $2,000 of direct revenue. 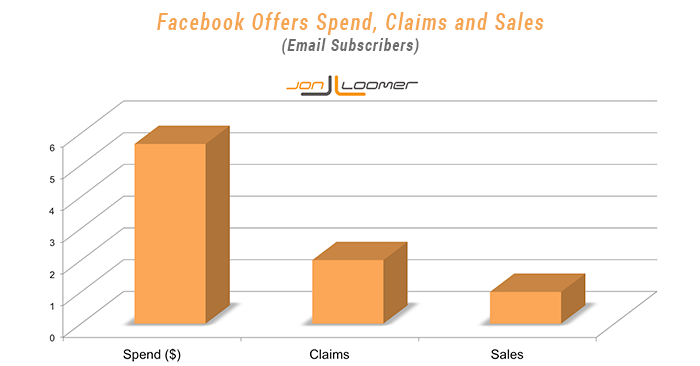 I’ve documented some incredible ROI results related to Facebook ads before. But this campaign was an interesting experiment due to the short run-time and the fact that it utilized a Facebook Offer. Some of the results weren’t shocking. When I targeted Fans and email subscribers, I received a far greater ROI than when I targeted non-Fans. Other results nearly knocked me off my seat. I spent $200 to reach fewer than 10,000 Fans and email subscribers. And while that seemed crazy, the results made it worthwhile. Let’s break down exactly what I did here before we start to pick apart the results. I created an online Offer within Power Editor using unpublished posts. 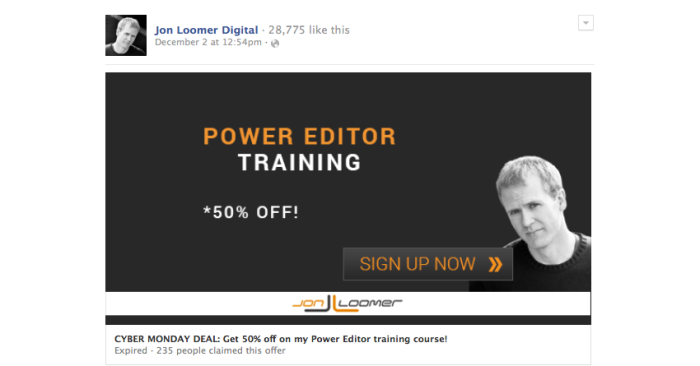 The product being promoted was my Power Editor training course. Note that I was very careful about the amount of text since I didn’t want this campaign to be delayed by the 20% text rule. The redemption link went to a checkout page with the discounted price of $73.50 (half off of the regular $147 price). This wasn’t ideal since anyone unfamiliar with the product was pushed straight to buying without learning more about the course. It was a bit sloppy, but since it was done last minute I had little choice. Also, this made analysis much more clean-cut. Since I didn’t promote this special deal anywhere else, you could only access it via the Offer. So the only way someone could redeem it was if they or a friend (the friend then sending the link to the purchaser) claimed the Offer. For the first campaign, I simply created a separate ad for each target audience (one for Fans and one for email subscribers). When I targeted email subscribers, I excluded those who were already Fans. In each campaign, I excluded anyone who had already purchased my training course. As mentioned earlier, I didn’t start the campaign until 10:22am my time on Cyber Monday (December 2). The Offer expired at Midnight, so it ran for under 14 hours. However, anyone who claimed the Offer had an extra day to redeem it. I did this for a couple of reasons. First, I didn’t want to shut out someone who claimed it right at about midnight. Second, I wanted to make use of the reminder Facebook sends (I had it go out the following morning at 10:00am). This ended up being the right decision since eight redemptions came in on the second day. I started out with a $100 total budget, $70 for the Fans and Email Subscribers campaign and $30 for the non-Fans. As sales started coming in for the first campaign, I repeatedly increased the Fans and Email Subscribers budget. In the end, I spent a grand total of $230 on this day. Of that, $200 was spent on my Fans and Email Subscribers campaign. I spent a total of $194.34 to reach 8,924 of a potential 14,000 Fans. I reached each Fan an average of 14.94 times (most in the sidebar) for an overall CPM of $1.46. CPM was much higher than normal. First, this was due to the high budget and short period of time. Second, you can bet I had far more competition for ad space because it was Cyber Monday. The funny part is that I had stopped my ads on mobile because the CPM was so high. But the result was that Desktop News Feed CPM skyrocketed. My assumption is that this would have happened (probably to an even greater extent) on mobile if I had kept the Offer running in that placement. So… How about those results? You’ll recall that my spend on Fans was $194.34, so this results in a 9.5X ROI when targeting Fans only. On the surface, it would seem I spent too much on Desktop News Feed, but the truth is that the Cost Per Sale only went up due to the increased budget and short time period. If I had kept my budget lower or focused on sidebar, I undoubtedly would have ended with a better Cost Per Sale and ROI, but the total number of sales would have been far less. It’s obviously evident that it would be nice to target Right Column on Home Page Only when focusing on the sidebar. Well, this feature is coming. In fact, I saw it temporarily on my Power Editor before it disappeared. Within that first campaign, I also created an ad targeted at a Custom Audience. This audience focused on non-Fans who are also on my email list. The result was a potential audience of only 1,640 people. Since the audience was so small, this ad didn’t get much activity. It did, however, generate a sale from minimal spend. Certainly successful, but not scalable given the small audience I had to work with. A few months back, I documented how I got a 35X ROI when promoting this same product with Facebook ads, though I didn’t get a single sale from non-Fans (who weren’t on my email list or targeted via FBX, at least). That was again the case this time when using Facebook Offers. Crazy, right? My Cost Per Offer Claim for Fans and email subscribers was $1.83 compared to $0.65 for non-Fans. Yet, not a single sale came from those non-Fan Offer claims. An important component here that didn’t help my conversion rate with non-Fans is that the redemption link went straight to a checkout page instead of a landing page that would have described the course in more detail. Still, the lack of sales activity from non-Fans is consistent with what I’ve been seeing in other campaigns. More evidence that you need to build up your relevant Fan base and focus your sales there. 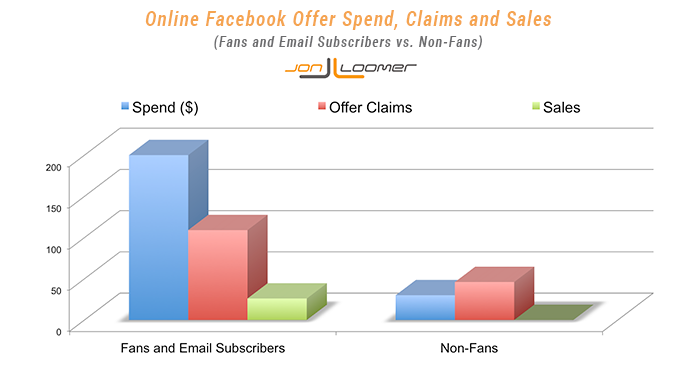 Am I surprised that Fans and email subscribers far outperformed non-Fans? Not at all. I’ve seen this repeatedly, and it’s why I urge you to build a Facebook sales funnel focusing on relevant Fans who will buy from you. But I was pleasantly surprised by the results in such of a short, spur-of-the-moment campaign. And I’m always skeptical whether Offer claims will result in sales. In this case, I’m finding that relevance and loyalty are key factors in converting an Offer claim into a redemption. 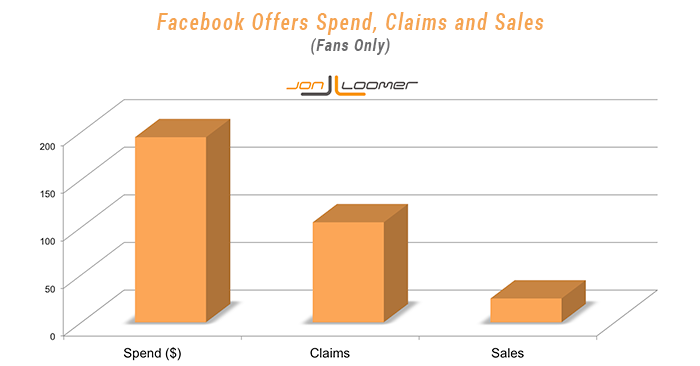 While the non-Fans didn’t redeem any of their 46 claims, more than 24% of Fans and email subscribers who claimed followed through with the purchase. Of course, these are the numbers of one Page selling one product. 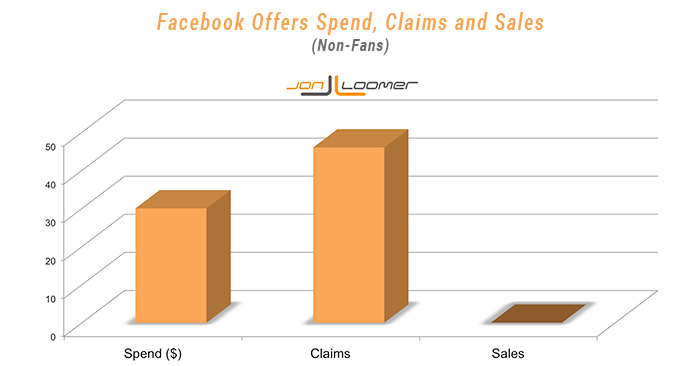 What kinds of results are you seeing from Facebook Offers?